Every major food culture has its iconic dishes. While it is often true that the purist and connoisseurs may beg to differ, such foods are hugely popular because of they are delicious and have a unique ability to cross cultural boundaries. Ask any Westerner a Chinese food they can think of and fried rice and egg rolls will rank near the top. 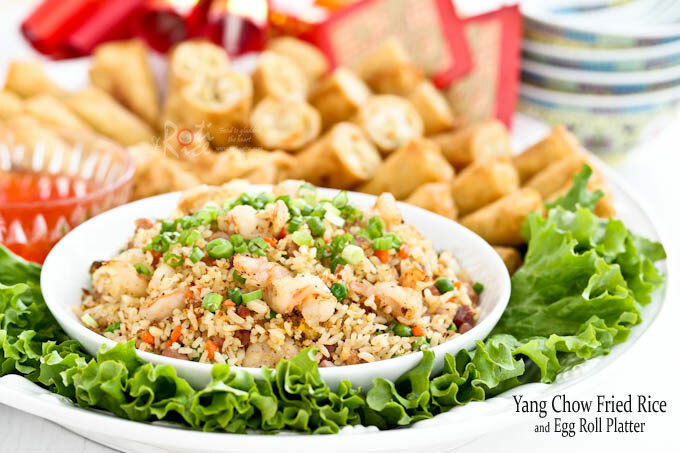 Among the varieties of fried rice, Yang Chow Fried Rice is a true classic. 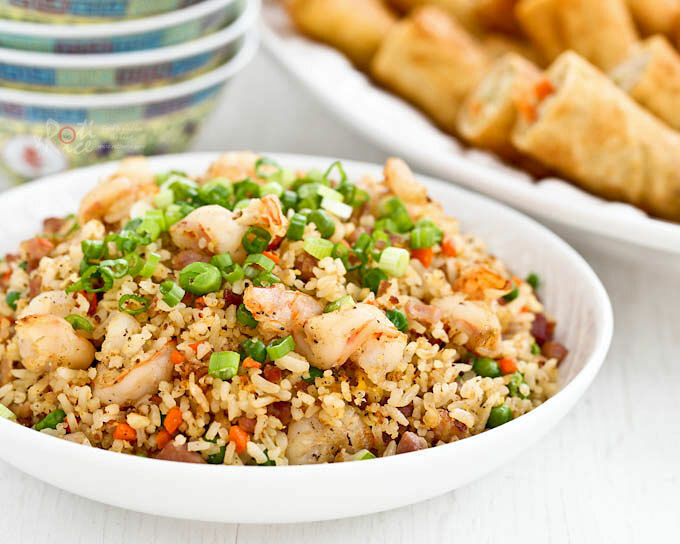 Widely reported to have been invented during the reign of Emperor Qianlong of the Qing Dynasty, Yang Chow Fried Rice has become a gold standard by which all fried rice are measured against. The 2016 Chinese New Year falls on February 8th. This is the year of the Red Monkey where the color red corresponds to the fire element. Celebrations begin with the Reunion Dinner on the eve of the new year. Grown children from near and far usually return to their parents home to join in the festivities. 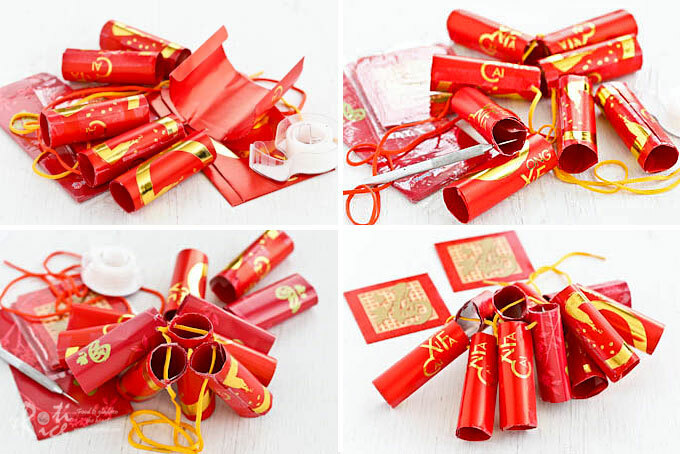 Families in China and overseas Chinese communities everywhere are already preparing for the celebrations which can last up to 15 days. It is a busy and exciting time as people spring clean and decorate their homes, purchase new clothes, and make lots of goodies. The Reunion Dinner provides one of the biggest culinary challenge for the matriarch of the clan. Many of the dishes are elaborate and time consuming to prepare. Planning some easy ones in the mix will make things a little more manageable in the kitchen. Quick and easy Yang Chow Fried Rice can be served as a tasty staple in combination with the other dishes. The shrimps in the fried rice signify joy and happiness. Gatherings for relatives and friends are often held during the first three days of the Chinese New Year. 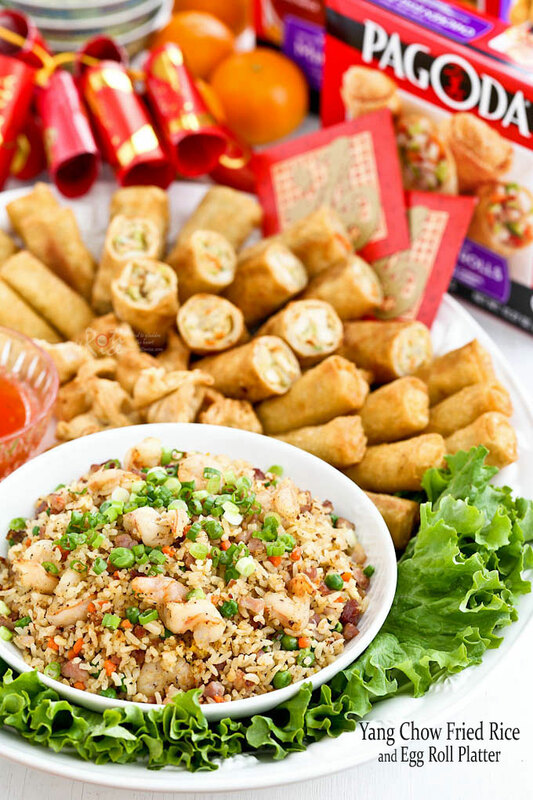 In a party spread, fried rice and egg rolls are always well received. Egg rolls are a great choice for the Lunar New Year because they resemble gold bars which symbolizes wealth and prosperity. 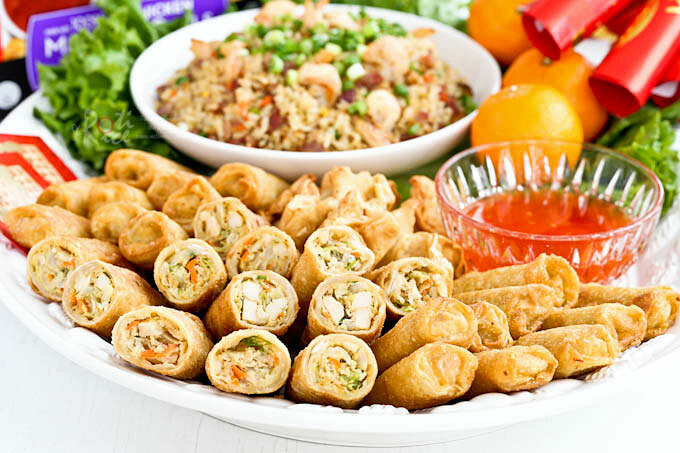 One can never serve too many egg rolls but they can be very time consuming to prepare. Fortunately, there are Pagoda Chicken Eggrolls made with 100% white meat chicken, freshly cut cabbage, carrots, celery, and onion. There is no MSG or artificial colors added. Best of all, they can be easily reheated and crisp up in a conventional oven, microwave oven, or deep fried in 20 minutes or less. They even come with sweet chili sauce which is really convenient. 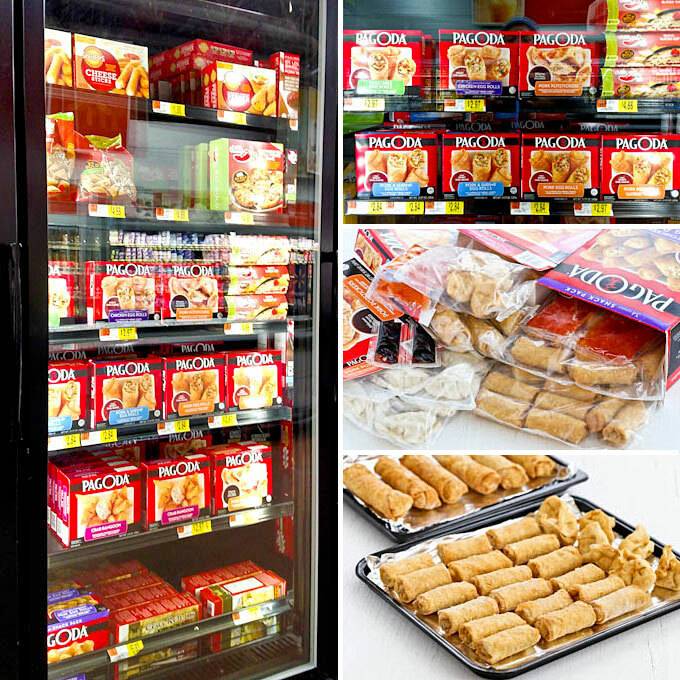 Pagoda really lives up to its motto, “Everything your hunger demands” by offering a range of products which include egg rolls, crab rangoon, cream cheese wontons, and potstickers. All these can be found at Walmart. Do check out their Ibotta Offer by joining iBotta and earning $0.50 when you buy 2 Pagoda snacks of any variety and any size. Now, back to my Yang Chow Fried Rice. In my version, I have decided to coat the rice with the egg mixture. Alternatively, the eggs can be scrambled separately and added to the fried rice towards the end of cooking. Either way works. To serve, I transferred the fried rice to a shallow dish and sprinkled some sliced green onions on the top. Then I placed the dish on a huge platter lined with green lettuce, a must-have vegetable for the Chinese New Year because it symbolizes growth in riches and wealth. Then I arranged the egg rolls around the platter to make it look pretty and inviting. Add 1 tablespoon of vegetable oil to a wok or large pan. Fry ham for 2 to 3 minutes. Remove and set aside. Add 2 tablespoons vegetable oil to the wok. Saute garlic for 20 seconds. Add carrot and shrimps and continue to cook for 2 to 3 minutes. When shrimps start to curl, add green peas. Continue to stir fry. Then add cooked rice, ground pepper, salt, and soy sauce. Stir to get everything well mixed. Return ham to the wok. Again stir to mix. Using spatula, create a well in the center of the pan. Lightly beat eggs, ground pepper, and soy sauce together. Pour egg into the well and fold rice back onto the egg. Continue to stir until the egg is cooked and rice is dry and fluffy. This will take 2 to 3 minutes. Transfer to a serving dish. Sprinkle green onions on the top and serve immediately. I hope I have given you some ideas on how to prepare and serve a food platter perfect for the upcoming Chinese New Year celebrations. 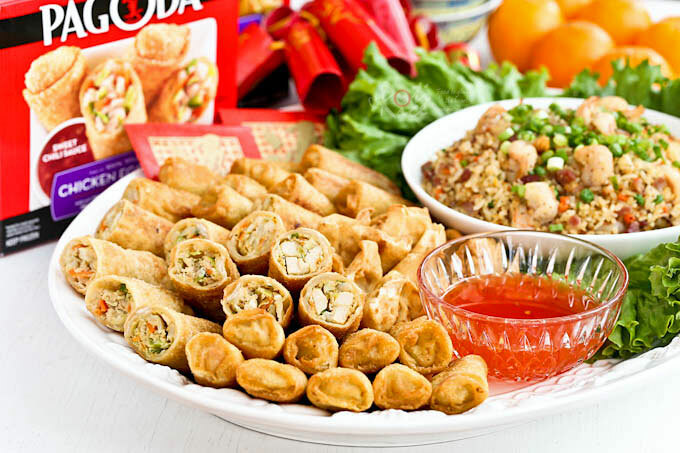 I can’t wait to see your beautiful and creative pairings with convenient and delicious Pagoda appetizers and snacks.